Entities associated with Sweet Leaf Marijuana Centers have been sued at least twice since April by landlords seeking to get paid back rent or to evict the chain. Last week, real estate firm Edens, which became Sweet Leaf’s landlord when it purchased properties in RiNo in late April for $50 million, filed a lawsuit in an effort to kick the company from 2609 Walnut St.
Like all of Sweet Leaf’s stores in the city of Denver, the RiNo location has been closed since December, when police raided the business as part of an investigation into alleged “looping,” the practice of making multiple sales of up to an ounce of recreational marijuana (the maximum an individual is allowed to possess under Colorado law) to the same customer on the same day. Sweet Leaf has argued that the practice was not explicitly outlawed at the time. Edens also says in the lawsuit that Sweet Leaf violated its lease by failing to operate in the building for 30 consecutive days. Edens asked the court to grant it possession of the property. The lawsuit also names as defendants Sweet Leaf owners Christian Johnson, Matt Aiken and Anthony Sauro. Edens is represented in the lawsuit by Bill E. Kyriagis of Denver’s Otten, Johnson, Robinson, Neff & Ragonetti. Kyriagis did not respond to a request for comment. Sweet Leaf also did not respond to a request for comment. A separate lawsuit was filed in early April against Johnson, Aiken and Sauro by three related entities that own property at 4125 Elati St., 4175 Colorado Blvd. and 7200 E. Smith Road in Denver. 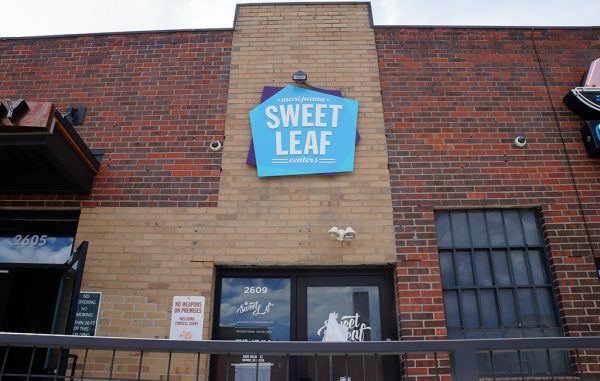 Sweet Leaf leased the properties in January 2017, but failed to pay rent starting in January 2018, according to the lawsuit, which says the company owes more than $700,000 in rent. The lawsuit says Sweet Leaf once employed 306 people, a figure that has since dropped to less than 60 because of the dispensary closures. It says Sweet Leaf is believed to have once had sales revenue of $5 million to $7 million per month from its Colorado dispensaries. Sweet Leaf opened in 2009, selling marijuana solely for medical use until 2014, when recreational pot became legal. It hasn’t entirely shut down. The company’s website lists locations in operation in Aurora, Federal Heights and Thornton, as well as Portland, Oregon. Sweet Leaf is awaiting a final decision on whether the company’s Denver marijuana-related licenses will be formally revoked. Denver Department of Excise and Licenses Director Ashley Kilroy is expected to rule on the matter this month, according to Westword.